Style, sophistication and prestige have come to define the annual BMW International Polo Series. 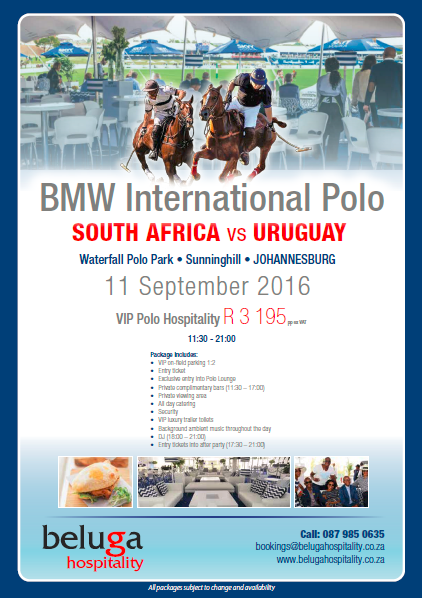 The second test will be played at Waterfall Polo Estate in Sunninghill, Johannesburg on Sunday 11th September. The Uruguayan Polo Association will send a 23 goal team to participate this year. The team is to include Mauricio Sánchez (5) at number 1, Alejo Taranco (7) at number 2, Santiago Stirling (5) playing in the number 3 position with Juan Curbelo (6) in the number 4 position. Uruguay have only toured South Africa once before for this Test Series in 1989 during which the visitors were victorious. Don’t miss out on what promises to be another action-packed, thrilling event, book your hospitality tickets now. A day of elegance between man and beast will be matched by a host of celebrities and VIPs reveling in the finest wines, gourmet food and a display of the latest BMW vehicles.